Infiniti QX30 Running Costs, MPG, Economy, Reliability, Safety | What Car? Opt for lower-priced Premium spec and the QX30 is competitively priced against most rivals, given the decent equipment list. Sat-nav, the important connectivity functions, rear parking sensors, auto lights and wipers, cruise control, dual-zone climate control, 18in alloys and contrast roof rails are all standard. Stepping up to Premium Tech does bring LED headlights, leather upholstery, electric seat adjustment and keyless entry, but frustratingly you’ll still have to get your keys out to start the car and it comes with some questionable-looking wooden interior trim inserts as well as a substantial price jump. However, while the list price isn’t too bad on Premium QX30 models, the resale values are difficult to predict. Infiniti is quite a new brand to the UK and it’s still establishing itself, so it’s fair to expect that values on the used market won’t be as good as those for the BMW X1 and Audi Q3, and they’ll likely be much less than the ever in-demand Range Rover Evoque. CO2 emissions are fairly good given the all-wheel drive and automatic gearbox, so company car users can expect decent monthly tax payments. However, that’s only true for those business users set on a high-end, all-wheel drive compact SUV, since many rivals offer front-wheel drive, more efficient versions of their classy soft-roaders, which will be cheaper and will make a lot more sense for those paying on company car tax. Safety equipment is very good, with lane-assist, emergency city braking and seven airbags included. 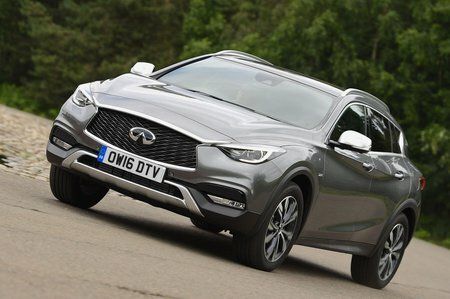 The hatchback equivalent of the QX30, the Q30 (which is the same body and platform without raised suspension), achieved five stars in Euro NCAP crash tests.